An adventure game in which we play the title giant spirit. While playing at Ghost Giant, we take care of the lonely Louis and also help the inhabitants of Sancourt to solve their troubles. The production was created with the goggles of virtual reality in mind. 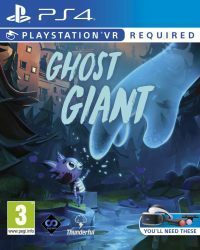 Ghost Giant is an adventure game developed by independent studio Zoink Games - a team whose portfolio includes a warmly welcomed Fe and Flipping Death. The production was created with the PS4 platform and virtual reality goggles in mind. In the course of the game at the Ghost Giant we play the title giant spirit, which goes to Sancourt, a seaside town inhabited by anthropomorphic animals. The protagonist has to take care of Louis, the lonely boy living on the farm with his mother. Although initially the child is afraid of his new companion, over time he becomes more and more confident in him. The story told in the game is written by Sara Bergmark Elfgren, whose work (including novels, comic books and scripts) has been translated into twenty-five languages. In the Ghost Giant released on the PS4 platform we observe the action from the perspective of the first person (FPP). Thanks to the giant size of the spirit in which we embody ourselves, as well as the fact that nobody else but Louis sees it, we can look at the everyday life of Sancourt's inhabitants, open doors and move objects like furniture, vehicles or trees, and even rotate entire buildings during the play. In this way we not only discover the secrets of the town (the area at our disposal includes a picturesque bay, a sunflower plantation belonging to the mother of our wards and a rubbish dump), but also help its inhabitants (and, of course, Louis) in solving their troubles. Ghost Giant's three-dimensional graphics are pleasing to the eye thanks to the cartoon design and colorful colors. Expectations: 8.5 / 10 calculated out of 3 players' votes.